Cut down on watering! Do your hanging baskets need moisture throughout the day? Do you keep watering your plants only to have the water trickle out the bottom onto your patio, deck and indoor flooring? Then you need our clear vinyl hanging drip pans! Fast and easy, the clear vinyl hanging basket drip pans snap onto the hanging basket. There's no more mess because the pan catches water drips. No wires are required because it uses molded built-in locks. 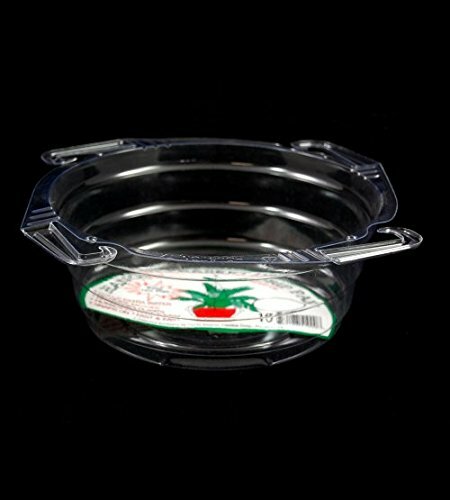 Purchase a 5 pk of 8" Drip Pans 8" diameter top x 3.5"depth x 6" bottom. In stock and ready for shipping. Drip Pans work as a watering devise by filling it full of water and letting it slowly water the hanging basket thru absorption. Humidifies the plants! Prevent water dripping thru the hanging baskets. No More Mess! No fuss! Snaps on fast & easy! This is very effective in hot and dry weather. Simply pull up the plastic hooks & clip over the hanging basket lip. If you have any questions about this product by Curtis Wagner, contact us by completing and submitting the form below. If you are looking for a specif part number, please include it with your message.